Safe to Crack to One’s Own Neck? Have you ever felt stiff and tight in your neck and you bend and force it to rotate in order to get that “cracking” sound? Is it painful? As a chiropractor, hearing my patients tell me they “crack” their own neck makes me cringe!!! 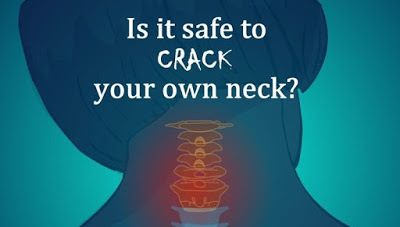 I guess that answers the question…NO, it is NOT safe to “crack” your own neck! The moveable joints in your cervical spine, and the rest of your spine, as a matter of fact, are called synovial joints. The joint capsules are lined with a synovial membrane that creates a synovial fluid which lubricates and nourishes the joints. That synovial fluid forms gasses which build inside the joint capsule and increase the pressure. The stiffness and tightness you feel are caused by that pressure change. Movement of the joint causes a release of built-up pressure creating the “popping” or “cracking” noise you hear. It’s the same idea as popping the top on a soda. You hear the carbon dioxide case being released from the can or bottle producing the popping and fizzing noise. You also hear that noise when you get a chiropractic adjustment. But what’s the difference between a chiropractic adjustment and “cracking” your neck yourself? A chiropractic adjustment is very specific. Chiropractors go through years of graduate school to learn the ins and outs of the spine and orientation of the spinal joints. We know what direction the joint needs to be moved in order to properly adjust it. When you “crack” your own neck, you are not actually achieving an adjustment. You are forcing the joint to move for the sole purpose of releasing the built up gasses and relieving the pressure in the joint. Therefore, the segment of the spine that “cracked” didn’t actually move. You just jammed the joints together. So the underlying problem still remains. When you get a chiropractic adjustment, the chiropractor is able to move the segment of the spine that is misaligned while relieving the pressure in the joint. The results of the chiropractic adjustment are longer lasting, less painful and much safer. Continually “cracking” your own neck can be detrimental over time. When you force your neck to “crack” and those joints jam together, you are jump-starting the degeneration process. That forceful collision of the vertebra surrounding improperly moved joints will stimulate bone growth and start to create bone spurs that can infiltrate the foramina (or openings) which house the nerves exiting the spinal cord. As the bone spurs or hypertrophic (overgrown) bone grow, more and more pressure is added to the nerves creating radiating symptoms such as pain, numbness and tingling in the head, neck, arms, and hands. Once the degeneration process starts, you can never get back to where you were before…you can only stop it from getting worse. The best solution to the problem is to find a chiropractor you trust (like any of the 4 amazing doctors at Pro Chiropractic) and allow them to adjust your neck and spine properly!!! We will not only relieve the tension and built-up pressure in your joints, but we can also relieve muscle tension and pain that may be facilitating that discomfort. Come get adjusted today and find out for yourself how much better a chiropractic adjustment feels than “cracking” your own neck.